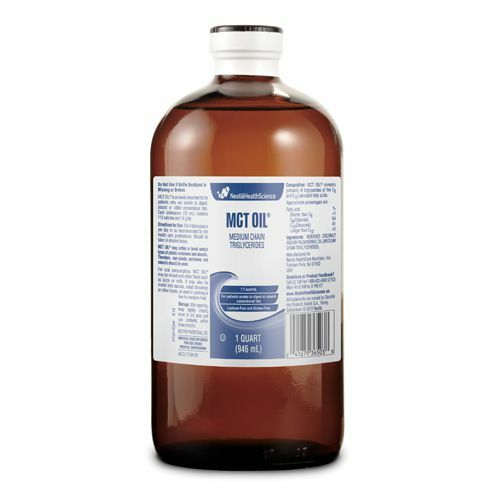 The Nestle MCT Oil Medium Chain Triglycerides Unflavored 1qt Each, Model #3651300, is anchored in advanced science and research. Nestle Healthcare Nutrition offers nutritional solutions for people with specific dietary needs related to illness, disease states or the special challenges of different life stages. The Nestle MCT Oil Medium Chain Triglycerides Unflavored 1qt Each is a fat source that is specifically formulated for those who are unable to digest or absorb fats from conventional foods. MCT's are more readily hydrolyzed and absorbed than long chain fats. They are also absorbed directly into the portal circulation and do not require bile salts for emulsification. Use of MCT as part of a ketogenic diet requires medical supervision. Decreased pancreatic lipase, decreased bile salts. Defective mucosal fat absorption (decreased mucosal permeability, decreased absorptive surface). Defective lymphatic transport of fat (i.e., intestinal lymphatic obstruction). INDENDED EXCLUSIVELY FOR ENTERAL FEEDING AND PATIENT HYDRATION. WARNING: This product is not intended as a sole source of nutrition. Avoid use in patients with uncontrolled diabetic ketoacidosis. Ingredients: Modified Coconut and/or Palm Kernel Oil (Medium-Chain Triglycerides).